The philosophical question which has plagued us all at one point – where does space begin? Don’t try and hide it, that is the question that you have all been asking yourself today. Well, this happens to be your lucky day so prepare to be enlightened. The most widely accepted altitude where space begins is approximately 100 kilometers which equates to about 62 miles. In perhaps a contradictory move, the US space agency willingly awards astronaut status to any person who flies above 50 miles in altitude. If you drove 50 miles in a car if might not seem that much, I probably cover that sort of distance on a day to day basis. To throw some context onto how far a vertical 50 miles is just think of a typical passenger jet plane. The average cruising altitude for a passenger jet is approximately 30,000 feet, which is just under six miles in altitude. Even the world’s most powerful military jets can’t climb to more than 100,000 feet in altitude which equates to about 19 miles above the earth’s surface. The thought of actually vertically climbing above the earth’s atmosphere is quite mind boggling. So the thought of an iPad being sent up to the heights of a military jet then forced to plummet to earth seems like a sudden and devastating death would be on the cards for the device. 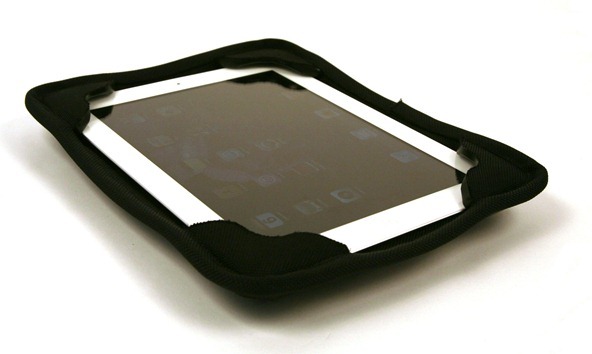 Well believe it or not, the G-Form company believed a different ending was written in the stars and decided to test that by sending an iPad, attached to a hot air balloon, 100,000 feet into space dressed only in a G-Form 6 Extreme Edge case. The stunning high definition footage makes an astonishing watch as you see the iPad rise above the surface until the hot air balloon bursts at altitude. The rest of the video is a bit of a swirling confusion as the device plummets toward earth, finally ending its journey as it smashes into the ground somewhere in the Nevada Countryside. Watch the video all the way to end and prepare to be blown away. In the battle of the G-Form clad iPad versus space, the iPad walks away the clear victor as it is still full functional. Please note, even if you are an owner of a G-Form Extreme Edge sleeve, I would not recommend attempting to recreate this experiment.